One coloured A4 double sided profiles & instruction sheet, 1 B&W A4 sheet of more airframes and other information, 1 A6 decal sheet and 2 smaller sheets. Interesting schemes, clear, sharp and in perfect register decals, covering a range of Bell variants. 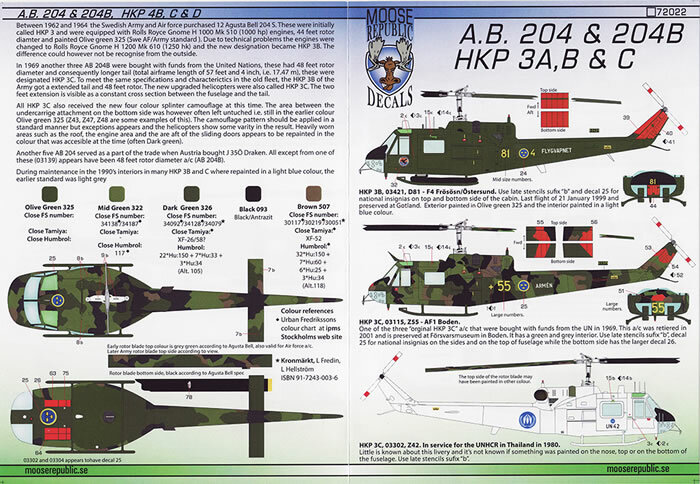 An excellent set of Swedish decals from Moose Republic with some great schemes for the Bell 204 helicopters. The splinter style schemes will certainly produce an awesome chopper if your game. Firstly, let's have a quick Swedish lesson. 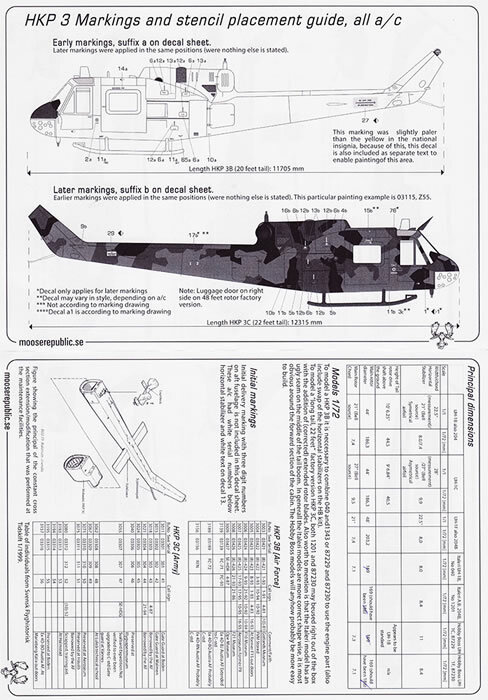 The "HKP" designation comes from the Swedish work "Helikopter". In 1997 they were transferred into one common Helicopter Wing the now carries the marking Forsvarsmakten (Defence Power). This will explain the tail boom markings with the decals. The Bell 204/205 UH-1 single engine helicopter was built in huge numbers in the USA 1959-1987. 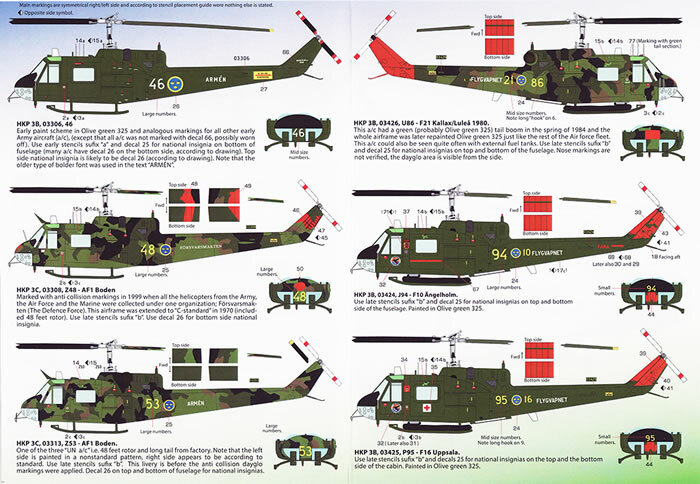 Including license production abroad, more than 16.000 "Hueys" were produced. It served in the Vietnam war as a transport helicopter, ambulance and gunship. The Swedish military authorities decided in 1960 to choose the type as the first medium lift helicopter in the Swedish Defence. For reasons of trade policy, the 19 machines were to be license-manufactured at Giovanni Agusta at Gallarate, Italy. The helicopters got the Swedish designation HKP 3A. Twelve helicopters were intended for the Army and seven for the Air Force. The deliveries took place 1962-1964. The Italy-built helicopters were, unlike the American, powered with a Rolls Royce Gnome H 1000 Mk 510 engine of 1.000 hp, Swedish designation TM2A. This engine was unfortunately affected by a lot of troubles. With the beginning in 1965, the old engines were replaced by the stronger and more dependable Bristol Siddeley Gnome H 1200 Mk 610. This engine, Swedish designation TM2B, delivered 1.250 hp. The designation of the helicopter was changed to HKP 3B. In 1969, three more machines were delivered from Agusta-Bell to Sweden. This time they were paid by United Nations means and were to be used by the Swedish emergency troops. They had also the TM2B engine, but was built with some modifications. The length of the rotor blades were increased and the tail was therefore made 60 cm longer. This type were designated HKP 3C. Gradually, all HKP 3B's were rebuilt to HKP 3C standard. The HKP 3's of the Army was mainly acquired to be used for transport of troops, wounded and materiel. Behind the two pilots, eight, not too comfortable, seats for fully equipped soldiers were arranged. The seats could be replaced by up to six stretchers. The helicopter could carry a hanging load of up to 1.800 kg. This was often used to carry a water bag when fighting forest fires. The main task for the Air Force helicopters was Air Rescue Service, but they was also used for the transport of personnel to remote radar- and communication plants. At rescue missions, the crew usually consisted of four; two pilots, mechanic/winch operator and winchman. In many occasions, a doctor completed the crew. For emergency landing at sea, the helicopters were equipped with inflatable floats. 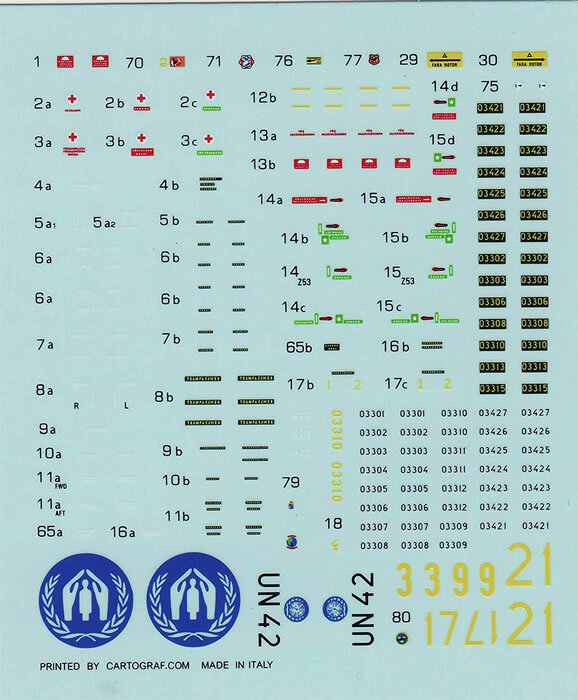 This decal set contains schemes for 16 different airframes and covering all 3 variants of the 204 used by Sweden.. Schemes vary from a white scheme, through olive green to the well know splinter schemes of the Swedish Defence Forces. Instructions are on 2 A4 sheets, one coloured and the other B&W. 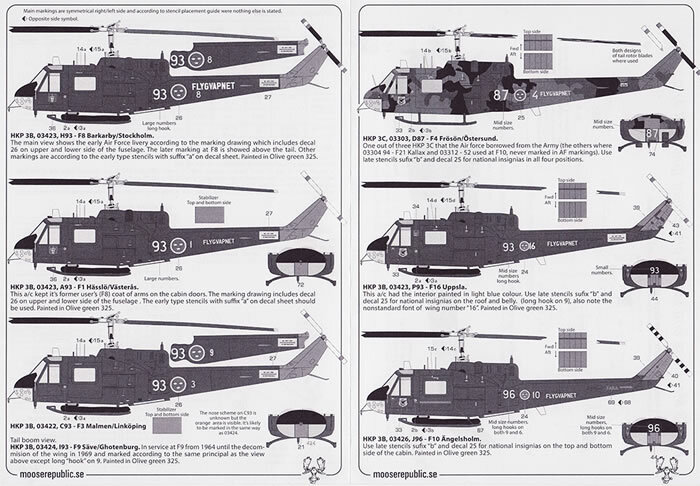 One of the B&W pages has stencil placement diagrams, as well as a list of differences between the various 1/72 Bell 204/UH-1 B/C versions and corrections that need to be made. It also has a list of the remaining airframes at various museums and gate guards around Sweden, which is quite interesting as well as useful. The other B&W sheet has 6 more profiles of repeating coloured airframes. Thanks to Moose Production Decals for the sample.